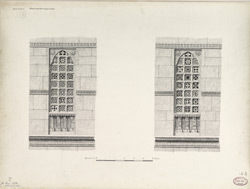 Illustration of a window from the Sayyid Alam mosque at Ahmadabad in Gujarat from James Burgess' 'Original Drawings [of] Muhammadan Architecture of Ahmadabad.' Ahmadabad, founded by Sultan Ahmad Shah (r.1411-42) developed the city wall and was responsible for the construction of several buildings and mosques. The Sayyid Alam mosque was constructed by Sayyid Alam Akbar Husaini in 1412 and it is believed to be one of the earliest mosques in Ahmadabad. The early provincial style of architecture in Ahmadabad, especially this mosque, demonstrated a fusion of Hindu and Islamic architectural and decorative elements.